An average of 500 million tweets are sent every day, which is equivalent to 3.5 billion Tweets sent every week. With all of that noise happening on the site, it can be hard to make sure your tweets get the engagement they deserve. To make that job easier, we’ve put together this guide on how to pull, analyze and improve your unique Twitter statistics to help you better your Twitter marketing. By being well informed about what works, you can guide your social strategy, improve your clicks, retweets and overall reach across the network. Just like snowflakes, no two Twitter presences are alike, and they should never be treated as such. A content and engagement strategy that works for one brand could be the exact opposite of what customers expect from another. The best way to figure out exactly what it is that’s effective for your own social presence is by looking at the hard stats. With tools out there like Twitter’s native analytics and Sprout Social’sTwitter analytics, it’s tremendously easy to pull your own unique Twitter stats. All you need to know is which Twitter stats you can look at, how to pull them for yourself, how to make sense of your data and most importantly how to use that date to improve your Twitter presence. Your impressions, also often referred to as reach, is the number of unique individuals who saw your Tweet within their social media stream. It’s a great stat to look at from a branding and awareness side of marketing, but as you can never be sure whether or not someone actually read your post, it can be somewhat misleading. Whenever someone does in fact see your social post in their Twitter stream, they have the ability to click on it. A click can be an individual expanding your entire Tweet, looking at your social image, following a link you may have shared or it could be completely inadvertent. Clicks are a popular stat to monitor as most marketers want to see people arriving at their websites via the social network. Similar to the “Likes” of Facebook, Instagram, Pinterest and LinkedIn, Favorites are a way for content consumers to give positive feedback to a Twitter post. Though sometimes viewed as a vanity metric, Favorites are a great stat to monitor as they illustrate which of your content is generally favored by the bulk of your audience. Retweets are similar to Favorites in that they give positive feedback to Twitter posts, except Retweets provide a much stronger signal. Not only are your social followers telling you they enjoy your content, they’re telling you that they enjoy it so much that they want to share it with their friends. Retweets are a great way to further amplify your posts and gain more Twitter followers. Replies occur when someone specifically responds to one of your Twitter posts. Replies are an amazing opportunity to start a conversation with someone on Twitter that could end up being your next customer. However, not all replies indicate a positive response and they should be studied on a message-by-message basis. Clicks, Favorites, Retweets and Replies all what we at Sprout Social consider to be Twitter Audience Engagement. Whether someone is sharing your post or replying to you directly, someone on the site is taking the time to engage with you as a brand. It is the most important metric to look at in social media management today, as it indicates you’re turning your Twitter followers into engaged users. Measuring your ROI is something modern marketers are obsessed with, and something that can be done by parsing your website analytics data with your Twitter data, but it doesn’t paint the more important picture of what social media is about today. Social media of today should be about creating meaningful one-to-one relationships with your customers in order to increase the overall lifetime value through brand discover, increased customer satisfaction and reduced customer churn. Modern tools have made it easier than ever to pull your Twitter data at scale. This article will discuss how to pull all of the stats we discussed above using either Twitter’s native platform or our own tool Sprout Social. If you haven’t used Sprout Social before you can start a free trial to pull your data, and it includes access to our entire suite of social media tools. Twitter now offers their own analytics platform to check out high-level data on your social page. Start by logging into the Twitter profile you want to get your statistics on and navigate to the Twitter’s native platform. Once you’re in the platform, navigate to the Tweets tab, choose a timeframe that you’d like to study and export that data. Then you’ll be ready to make sense of the data. We recommend using Sprout’s social media analytics because you can pull data from all of your social profiles at once, combine it with data from your other networks and profiles, and view it in a really beautiful platform. Well there’s the pitch, and if you’re interested in using Sprout Social to pull your Twitter stats, follow the rest of these instructions. Once you’re in your Sprout account navigate over to the Reports tab to view your data. We offer a ton of custom reports to better make sense of all your social media, such as hashtag and group reports, but for these specific purposes, it’s best to utilize our Sent Messages Report. Make sure to choose all of the profiles where you’d like statistics (including other networks if you’d like), choose a timeframe and export your new CSV. You’ll now have all the information you need to dissect your Twitter statistics. Before we can use the data to improve our Twitter marketing, we have to create a more digestible and visible chart. A simple way to do this is to add a filter to the first row of your page and sorting your messages by whichever performed the best based on your most valuable KPI. In the example above, we’d like to look at which of our Twitter posts perform best in terms of Clicks. We’ll next click the dropdown button in column G and sort by “Descending.” Make sure to sort by the stat you would most like to improve. 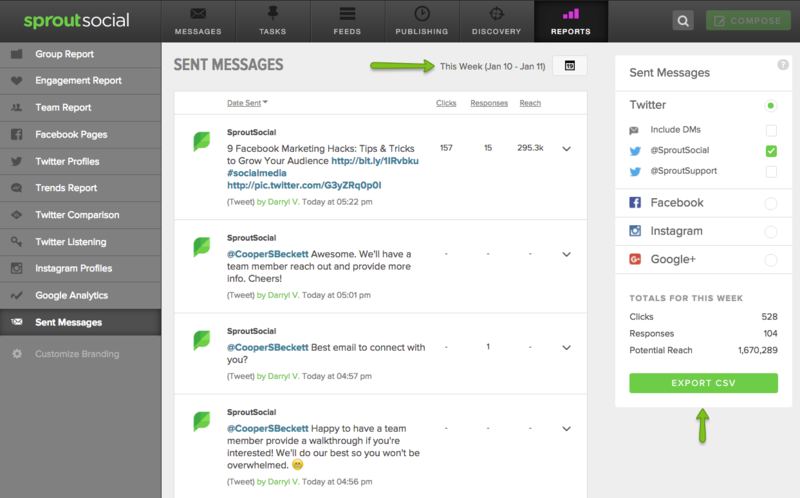 After sorting by your top KPI you’ll see the most successful messages at the top of the list. There are a ton of different Twitter posts that you can share across your pages. Consider the following post types and see which ones you find toward the top of your data file. Then you can incorporate more of that post type in your Twitter strategy. Text Posts: These are the most basic post types you can create. They’re simply a 140-character or less Twitter message without utilizing any of the additional functionality. Link Posts: Posts that contain links to your own or other websites that users can click through to visit. These are commonly found by searching the message copy for a shortened link like Bit.ly or goo.gl. Image Posts: Messages you’ve shared to Twitter that involve an image. You can find all of these messages by scanning your post copy for the key pic.twitter indicator. Video Posts: Video posts, including Gif posts, are becoming more popular than ever on social. Make sure you’re monitoring how well your videos perform and decide if you should keep utilizing them in your social strategy. Replies: Characterized by a message start with an @, these are direct replies to customers or fans who have reached out to you on Twitter. These will likely lead to more engaged users and clicks. After figuring out what post types work, discover what kind of message copy you use in those posts. If you find some key phrases or words that stand out in your top messages, try and include those more in your Tweets. Which days do I see the best performance? Which times of the day perform best? That’s the process we’ve put together for pulling, studying and improving your unique Twitter stats. For continued improvement of your stats, we recommend you check out our webinar with AdRoll “How to Be Awesome at Twitter” and learn more about Sprout Social’s Twitter management tools. Michael Patterson: Michael enjoys writing about all things social media, and his insights can be found on Adweek's SocialTimes, Social Media Today and Social Media Examiner. When he isn't pouring over blog posts he can usually be found exploring Chicago's unique neighborhoods and breweries.